"Frangipani" redirects here. For other uses, see Frangipani (disambiguation). Plumeria (/pluːˈmɛriə/) is a genus of flowering plants in the dogbane family, Apocynaceae. Most species are deciduous shrubs or small trees. The species variously are indigenous to Mexico, Central America and the Caribbean, and as far south as Brazil, but are grown as cosmopolitan ornamentals in warm regions. Common names for plants in the genus vary widely according to region, variety, and whim, but Frangipani or variations on that theme are the most common. Plumeria also is used directly as a common name, especially in horticultural circles. Plumeria flowers are most fragrant at night in order to lure sphinx moths to pollinate them. The flowers yield no nectar, however, and simply trick their pollinators. The moths inadvertently pollinate them by transferring pollen from flower to flower in their fruitless search for nectar.. Insects or human pollination can help create new varieties of plumeria. Plumeria trees from cross pollinated seeds may show characteristics of the mother tree or their flowers might just have a totally new look. Plumeria species may be propagated easily by cutting leafless stem tips in spring. Cuttings are allowed to dry at the base before planting in well-drained soil. Cuttings are particularly susceptible to rot in moist soil. One optional method to root cuttings is applying rooting hormone to the clean fresh-cut end to enable callusing. Plumeria cuttings could also be propagated by grafting a cutting to an already rooted system. The Plumeria Society of America lists 368 registered cultivars of Plumeria as of 2009. The genus is named in honor of the seventeenth-century French botanist Charles Plumier, who traveled to the New World documenting many plant and animal species. The common name "frangipani" comes from a sixteenth-century marquis of the noble family in Italy who claimed to invent a plumeria-scented perfume, but in reality made a synthetic perfume that was said at the time to resemble the odor of the recently discovered flowers. Many English speakers also simply use the generic name "plumeria". In Persian, the name is yas or yasmin. In Bengali the name is "Kath Champa", in Hindi, champa, in Gujarati champo, in Marathi chafa (चाफा), in Telugu deva ganneru (divine nerium), in Meitei khagi leihao. In Hawaii, the name is melia, although common usage is still 'plumeria'. In Malayalam it is called Chempakam. In Sri Lanka, it is referred to as araliya (අරලිය) and (in English) as the 'Temple Tree'. In Khmer, it known as "Champa" (also sounds like the country Champa). In Cantonese, it is known as gaai daan fa or the 'egg yolk flower' tree. The name lilawadi (originating from Thai) is found occasionally. In Indonesia, where the flower has been commonly associated with Balinese culture, it is known as kamboja, in Bali especially it is known as jepun. In French Polynesia it is called tipanie or tipanier and tīpani in the Cook Islands. In the Philippines it is called kalachuchi. In the Kannada dialect spoken in the Old Mysore region of Karnataka of southern India, the flower is called Devaga Nagale, devaganagalu or devakanagalu (God's Plumeria). In Vietnam; "cây sứ" which means the porcelain tree. In Mesoamerica, plumerias have carried complex symbolic significance for over two millennia, with striking examples from the Maya and Aztec periods into the present. Among the Maya, plumerias have been associated with deities representing life and fertility, and the flowers also became strongly connected with female sexuality. Nahuatl-speaking people during the height of the Aztec Empire used plumerias to signify elite status, and planted plumeria trees in the gardens of nobles. 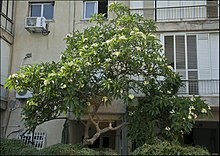 Flowering tree of Plumeria rubra decorating a garden in Tel Aviv, Israel. These are now common naturalized plants in southern and southeastern Asia. In local folk beliefs they provide shelter to ghosts and demons. They are also associated with temples in both Hindu, Jain, and Buddhist cultures. In several Pacific islands, such as Tahiti, Fiji, Samoa, Hawaii, New Zealand, Tonga, and the Cook Islands plumeria species are used for making leis. In modern Polynesian culture, the flower can be worn by women to indicate their relationship status—over the right ear if seeking a relationship, and over the left if taken. Plumeria rubra is the national flower of Nicaragua, where it is known under the local name "sacuanjoche". Plumeria alba is the national flower of Laos, where it is known under the local name champa or "dok champa". In Bengali culture, most white flowers, and in particular, plumeria (Bengali, চম্পা chômpa or চাঁপা chãpa), are associated with funerals and death. Also in the Philippines, Indonesia and Malaysia, the plumeria is often associated with ghosts and cemeteries. Plumerias often are planted on burial grounds in all three nations. They are also common ornamental plants in houses, parks, parking lots and other open-air establishments in the Philippines. Balinese Hindus use the flowers in their temple offerings. The plumeria's fragrance is also associated with the pontianak, an evil vampiric spirit of a dead mother in Malaysian-Indonesian folklores. 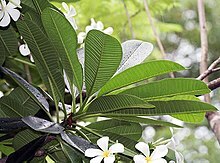 Indian incenses fragranced with Plumeria rubra have "champa" in their names. For example, Nag Champa is an incense containing a fragrance combining plumeria and sandalwood. While plumeria is an ingredient in Indian champa incense, the extent of its use varies between family recipes. 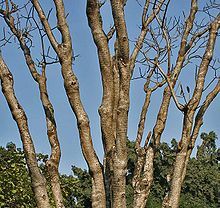 Most champa incenses also incorporate other tree resins, such as Halmaddi (Ailanthus triphysa) and benzoin resin, as well as other floral ingredients, including champaca (Magnolia champaca), geranium (Pelargonium graveolens), and vanilla (Vanilla planifolia) to produce a more intense, plumeria-like aroma. In the Western Ghats of Karnataka, the bride and groom exchange garlands of cream-coloured plumeria during weddings. Red colored flowers are not used in weddings. Plumeria plants are found in most of the temples in these regions. In Sri Lankan tradition, plumeria is associated with worship. One of the heavenly damsels in the frescoes of the fifth-century rock fortress Sigiriya holds a 5-petalled flower in her right hand that is indistinguishable from plumeria. There are a few more new hybrids now (Nui Delight, Nui's Diamond Rose, Nui's Dragon Heart, Nui's Light of Hope), named after Nui Leera from Thailand, who has planted over 100,000 plumeria seeds (2018). Red frangipani found in Malaysia. Plumeria in the Jardin des Plantes de Lille, Lille, France. ^ a b "Genus: Plumeria L." Germplasm Resources Information Network. United States Department of Agriculture. 2003-03-14. Retrieved 2010-09-08. ^ a b c d "World Checklist of Selected Plant Families". Retrieved May 18, 2014. ^ Urs Eggli, ed. (2002). Illustrated Handbook on Succulent Plants. 5: Dicotyledons. Springer. p. 16. ISBN 978-3-540-41966-2. ^ M.M. Grandtner (8 April 2005). Elsevier's Dictionary of Trees: Volume 1: North America. Elsevier. pp. 679–. ISBN 978-0-08-046018-5. ^ Haber, William A. (1984). "Pollination by Deceit in a Mass-Flowering Tropical Tree Plumeria rubra L. (Apocynaceae)". Biotropica. 16 (4): 269–275. doi:10.2307/2387935. JSTOR 2387935. ^ Thornton, Sharon H. (1985). The Exotic Plumeria (Frangipani). Plumeria Specialties. p. 21. ^ "Registered Plumeria". The Plumeria Society of America. Retrieved 2019-03-02. ^ "Zumbroich, Thomas J. 2013. 'Plumerias the Color of Roseate Spoonbills'- Continuity and Transition in the Symbolism of Plumeria L. in Mesoamerica. Ethnobotany Research & Applications 11:341-363". Retrieved 2015-04-15. ^ George William Septimus Piesse (1867). "The Art of Perfumery and the Methods of Obtaining the Odors of Plants: With Instructions for the Manufacture of Perfumes for the Handkerchief, Scented Powders, Odorous Vinegars, Dentifrices, Pomatums, Cosmetics, Perfumed Soap, Etc., to which is Added an Appendix on Preparing Artificial Fruit-essences, Etc". p. 23. Retrieved 2017-07-08. ^ Andrew Kettler (2015). "Making the Synthetic Epic". The Senses and Society. 10: 5–25. doi:10.2752/174589315X14161614601682. ^ "The Lantom or Leelawadee Flowering Tree of Thailand". Thailand-travel-guide.co.uk. Retrieved 2012-10-05. ^ "Frangipani - Tahitian Secrets". Retrieved 2017-05-12. ^ T. K. Lim (2013). Edible Medicinal And Non-Medicinal Plants. 7. Springer. p. 95. ISBN 978-94-007-7394-3. ^ "Cook Islands Biodiversity: Plumeria rubra - Frangipani". Retrieved 2017-05-12. ^ "Zumbroich, Thomas J. 2013. 'Plumerias the Color of Roseate Spoonbills'- Continuity and Transition in the Symbolism of Plumeria L. in Mesoamerica. Ethnobotany Research & Applications 11:341-363". Retrieved 2015-03-10. ^ Jones, Jay (April 22, 2008). "Hawaii keeps the lei-making tradition alive". Los Angeles Times. ^ "Symbolism of Wearing Hawaiian Flowers". Retrieved 2015-12-20. ^ Bautista, Norby (April 22, 2015). "The summer blooming of the Kalachuchi". Manila Bulletin. Retrieved December 19, 2015. ^ "Equinox Aromatics, LLC - Halmaddi - Ailanthus triphysa - India". Retrieved 18 August 2015. ^ Sharma, Garima; Chahar, Maheep K.; Dobhal, Sonal; Sharma, Neelu; Sharma, Tek Chand; Sharma, Mahesh C.; Joshi, Yogesh C.; Dobhal, Mahabeer P. (2011). "Phytochemical Constituents, Traditional Uses, and Pharmacological Properties of the Genus Plumeria". Chemistry. 8 (8): 1357–1369. doi:10.1002/cbdv.201000159. ^ College of Tropical Agriculture and Human Resources (CTAHR). Ornamentals and Flowers. Feb. 1998. OF-24. Wikimedia Commons has media related to Plumeria.